I mentioned in yesterday's post that I made two treats for Jeff to bring in for the coworkers on Wednesday Treat Day. You got to see the cookies yesterday and with a little teaser you saw what ingredients went into the other item. Chocolate Cherry Crumb Bars has quite a few steps to make, but the end result made the effort worth it. 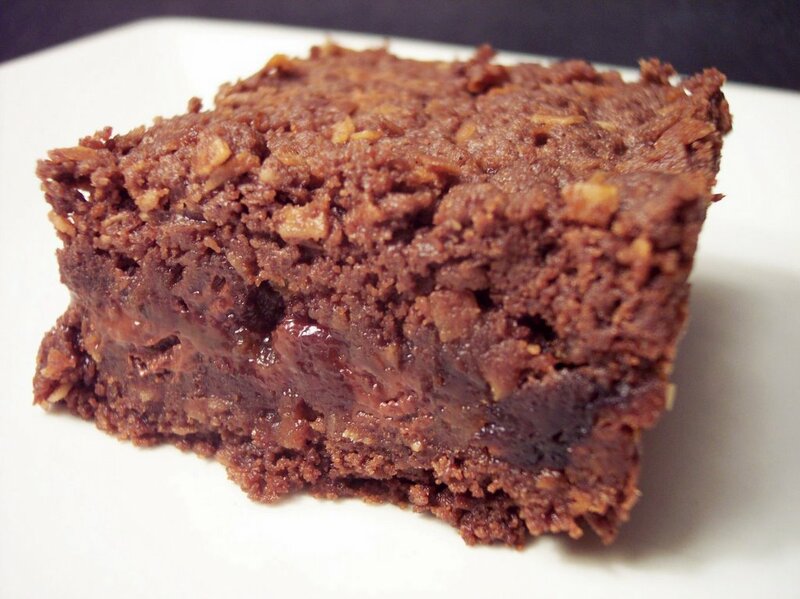 It seemed like almost a cross between a brownie and a cake with a crumbly topping. 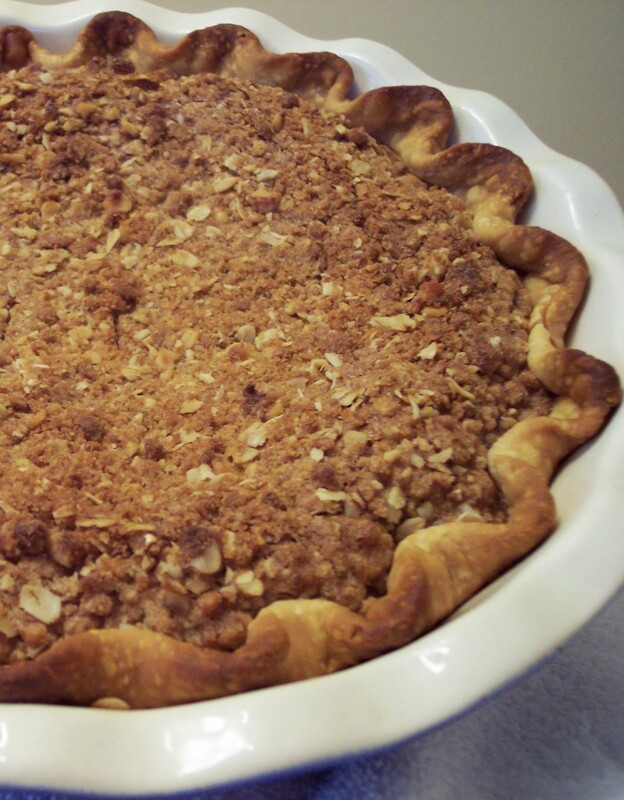 After baking the bottom layer, a mixture of plumped cherries is placed on top followed by a crumb topping of the base. The top layer is not fall apart crumbly as each bar cut very cleanly. Deep chocolate flavor filled each bite with a hint of coconut throughout. Close in flavor to a black forest cake. I'm not sure if I can describe this enough to do it justice - it was just that good. Spicy Sesame Noodles was on tap for dinner tonight. This was a quick pasta dish that had quite a punch of flavor. 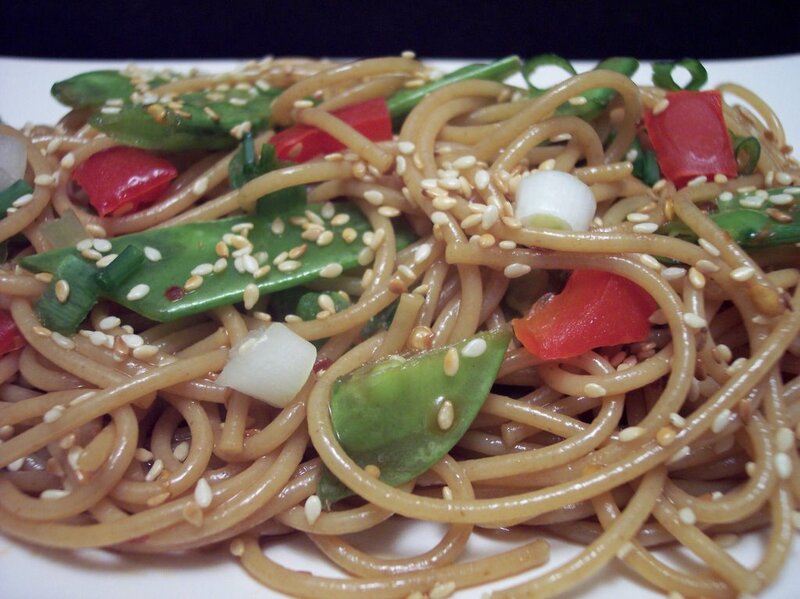 Using both sesame oil and toasting sesame seeds brought out such a nutty flavor. Whole Wheat spaghetti had just enough bite to hold up against the spicy red pepper flakes. I was able to get some really nice looking snow peas and the added fresh crunch from them gave a great contrast of texture. 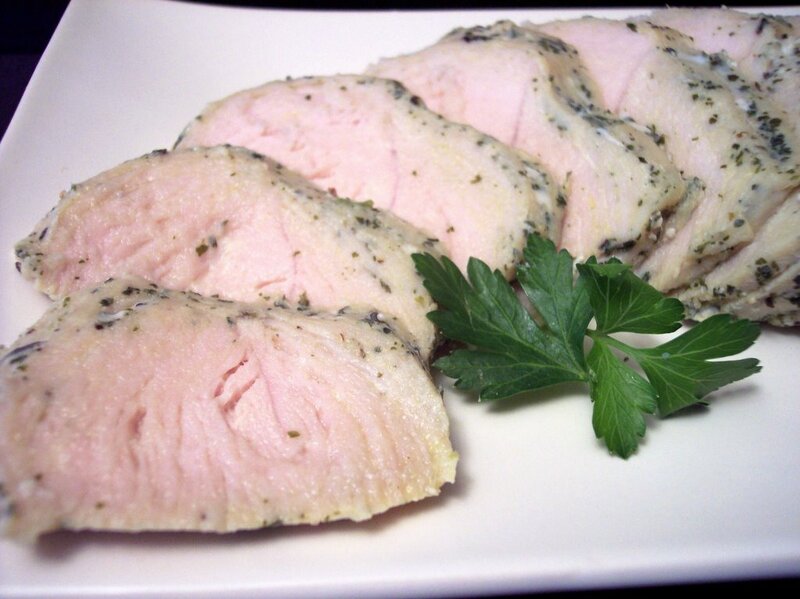 Easy, quick, and flavorful - definitely something I will remember if I need a fast dish. Tuesday's are a fun day as I get to bake treats for Jeff to bring in for the co-worker's on "Wednesday Treat Day" as we call it now. I made two recipes from Martha's Cookie magazine, one you will see today and the other will have to wait until tomorrows post! Cream Cheese-Walnut Cookies made a ton of cookies for me, despite what they said the yeild was. They say to expect 48 and I got 68! I don't see how they only get that many unless they cut them differently than they say. With as much butter that is in this recipe, I'm very glad it made so many cookies! To help keep their round shape while firming up in the freezer, I took a leftover papertowl roll and cut the cardboard down the middle. Placing the dough log inside, I found this helped immensely so it did not go out of its shape. 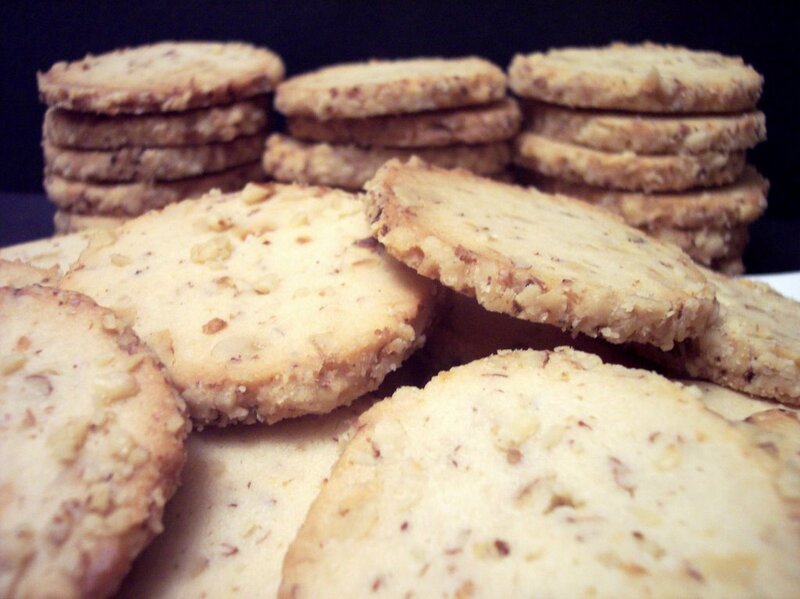 The texture and taste of these are like a buttery shortbread and almost melt in your mouth. The walnut flavor is very pronounced and toasting the ones that are mixed in the dough help pop out the intense nuggets of walnuts inside the rounds. I can definitely see making these to send out in holiday packages! Here's a peek of what I used for another item made for them today. 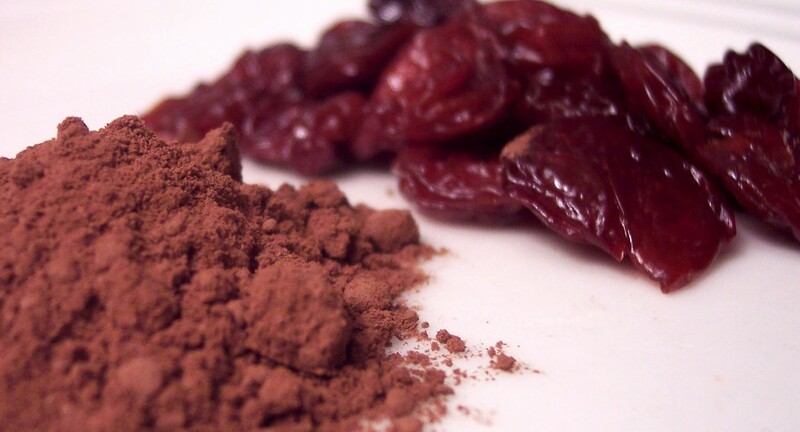 Chocolate and dried tart cherries.... a great combination - and the finished item is pretty rich. Tasting it did remind me of flavors from a black forest cake. Have I got you interested yet? 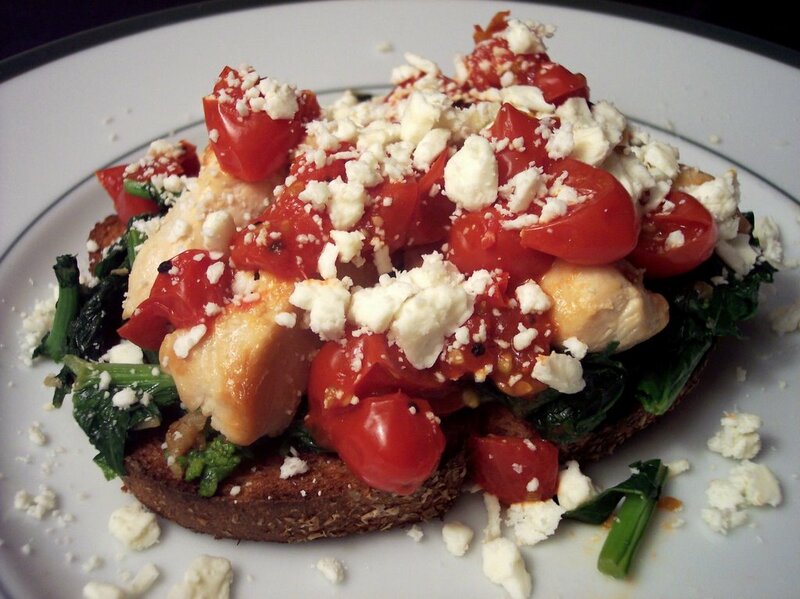 Dinner tonight was Chicken, Broccoli Rabe & Feta Country Toasts. This was not something that I would normally make, but it gave me a chance to try a new-to-us vegetable. This was a good dish, but I found we don't care much for the bitter taste from the Broccoli Rabe. 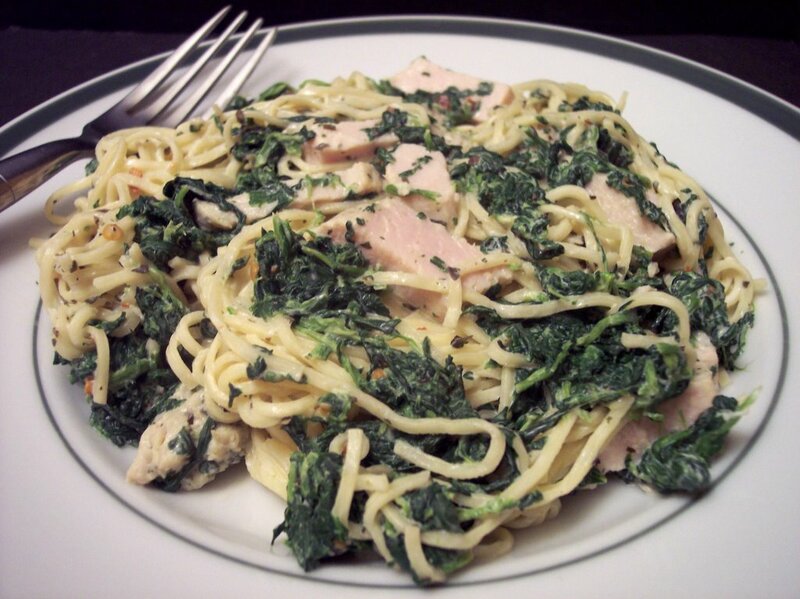 If I were to make this again, I would consider using Broccolini instead. The vinegar and sweet tomatoes did help with the bitterness but not quite enough. We used up the last of the bread I made a few weeks ago on Sunday. I've been looking for another type to try as we generally toast some on weekend mornings. We both love cinnamon so I went browsing for a sweet bread and looked to the Bread Baker's Apprentice for something I could modify. Cinnamon Swirl Bread originally had raisins and walnuts but I wanted a plain cinnamon swirl type bread. You could certainly knead in fruit and nuts if you wish about 2 minutes before the dough is ready to proof. After the dough went through its rising proccess, it was ready to be rolled out into 2 rectangles. 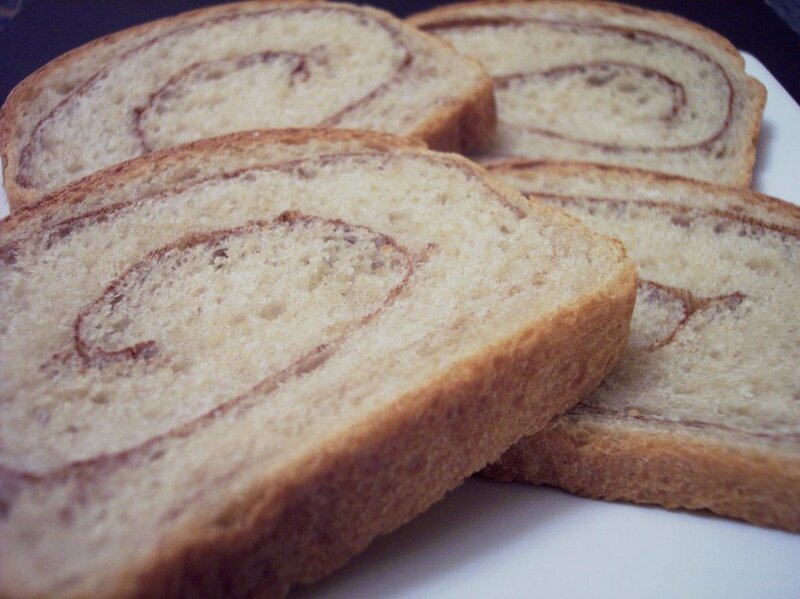 I put a generous amount of cinnamon sugar over the top and carefully, but tightly, rolled them into loaf shapes trying to keep the swirl going. I could hardly wait the hour for them to cool before I started slicing as the sweet cinnamon smell had me checking the timer every couple minutes. Dinner tonight made for a few dishes, but we both really enjoyed the results. 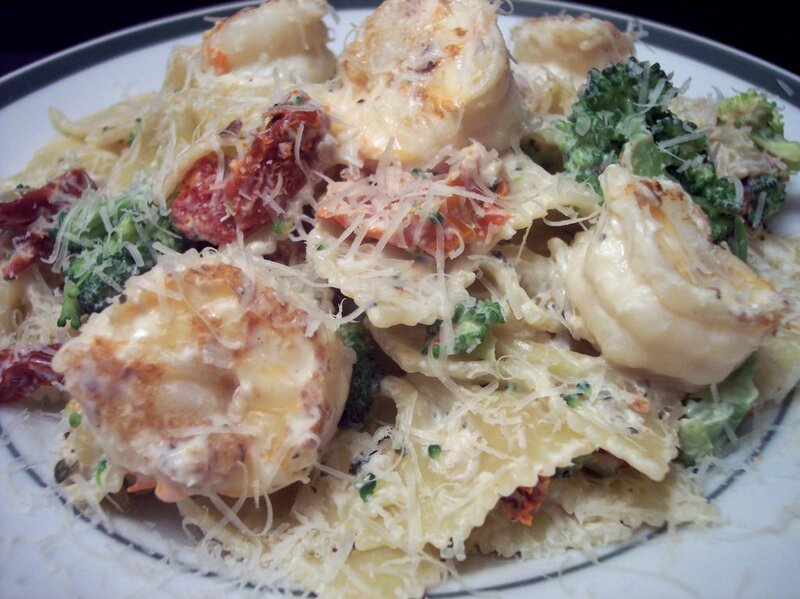 Shrimp, Broccoli, and Sun-Dried Tomatoes with Farfalle Pasta has a smooth and silky sauce that comes close to tasting like an Alfredo sauce. Crisp-tender broccoli and the tomatoes add great color and a contrast of flavors against the large shrimp. The shrimp came frozen from Trader Joe's and was already deveined which allowed for fast prep of only having to remove the shells. I did sprinkle the fresh parmesan over the top instead of mixing in with the sauce. This should reheat well and at 4 servings the portions were pretty large! Whew, what a busy week in the kitchen! The total ended up around 14 or 15 recipes with 13 of them being new ones. 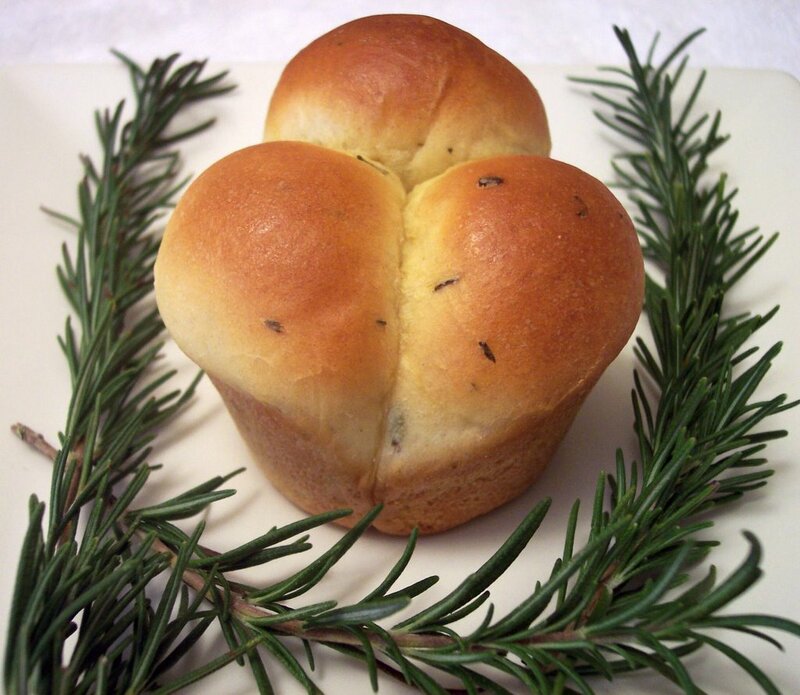 I think what we enjoyed most this past week was the Roasted Garlic and Fresh Rosemary Cloverleaf Rolls and Cranberry and Hazelnut Quick Bread. When I woke up this morning it was very chilly out! Growing up in MN, when it hit 40 degrees in the winter you would break out the shorts! Now dealing with 110 degrees most of the year in Phoenix, when it hits 40 (like this morning) I felt like I had to bundle up to go jump in the snow! Brrr! After we got back from the grocery stores today, I noticed I still had a fairly giant bag of cranberries in the refrigerator. I decided that I would go ahead and make some more muffins. I was not planning on it, but we had everything on hand and I had a few minutes to throw it together before lunch. 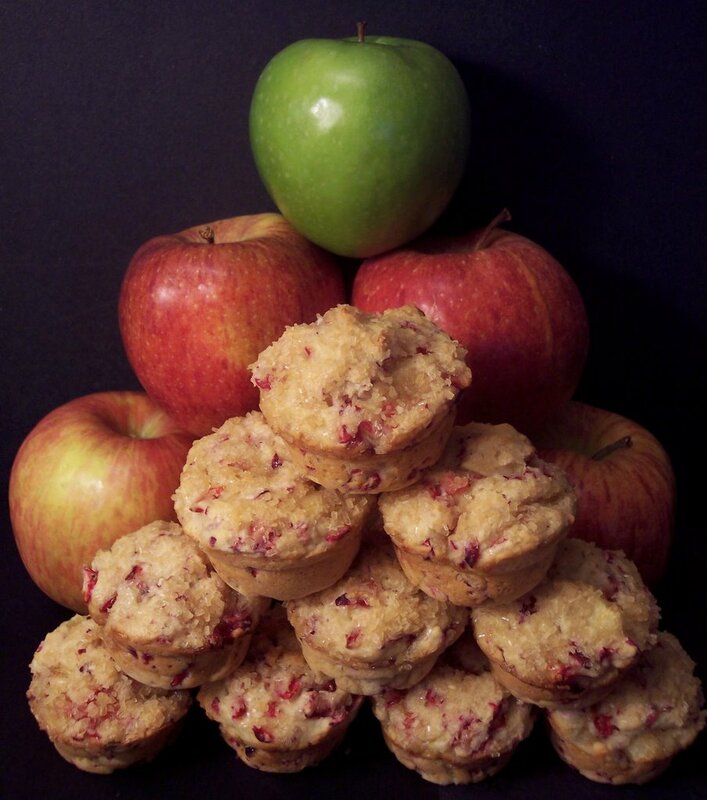 Cran-Apple Muffins are fairly quick to throw together using fresh cranberries and chunky diced apples. 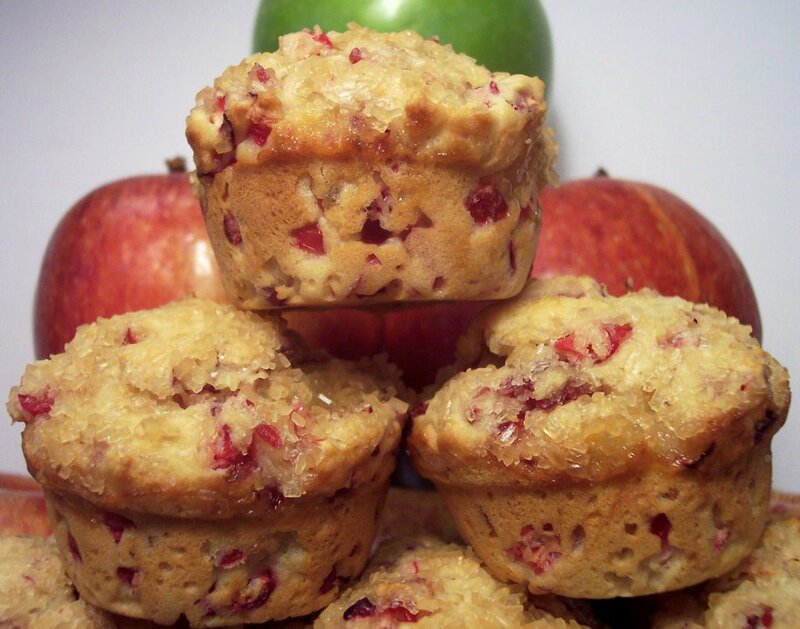 I like using Whole Wheat pastry flour in recipes like this, as it helps keep the muffins light and fluffy. Using a combination of half buttermilk and half apple cider gives them tenderness and an additional boost of apple flavor. A light coating of raw sugar on top gives a nice crackle and crunch. I have the menu set for this week so keep a watch out for what new things come from the kitchen! I plan on at least 2 more recipes from Martha's cookie magazine and we will see what else we can do! Stay tuned! Will you rub my belly? Here's Max again for Weekend Dog Blogging #11. Food bloggers from all over post pictures of their pups... so look for the round up over at sweetnicks sometime tomorrow night. 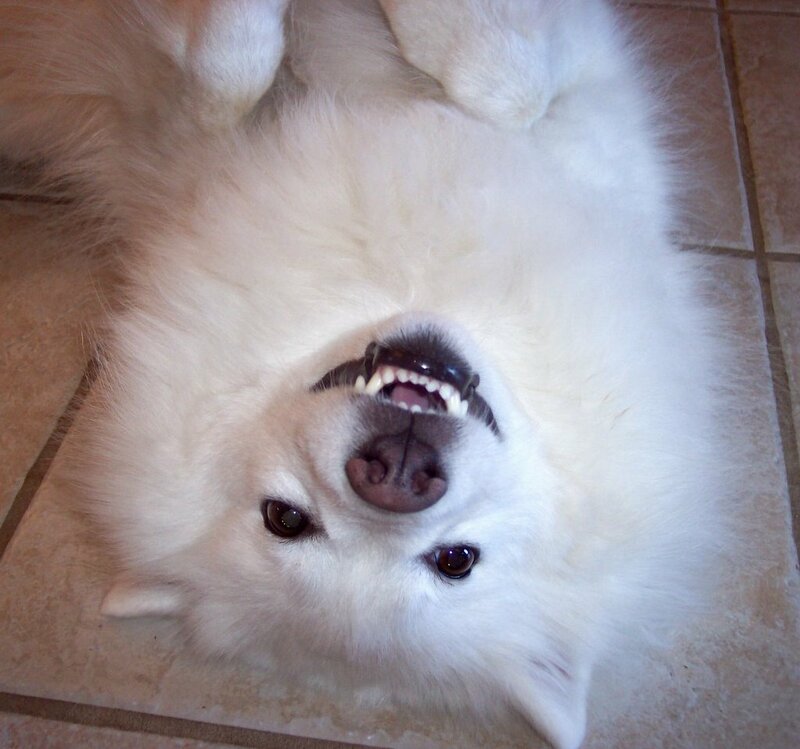 You can often find Max laying down like this waiting for someone to come rub his belly for him. If you hit the right spot, he even starts to shake his leg! Netflix has foiled any plans to watch movies this weekend! I'm sure because of the holiday (even though I sent the DVDs in on Monday....) they failed to send us new ones this week so alas movie night will be whatever we can find on TV. Maybe something on FoodTV can keep us entertained? One change in our normal Saturday salads - it is usually chicken, but in an effort to use up some turkey it will be Turkey salads tonight! Cranberries have really become a favorite of mine this past year. I'm not sure why, but we have really taken a liking to them. I did hear the other day on the news that there might be a shortage come christmas time so I might put a few bags in the freezer. 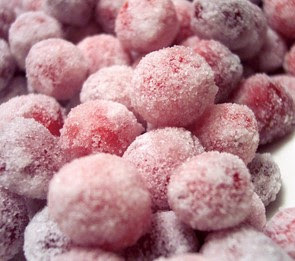 Sugared Cranberries is a fresh and different way of presenting cranberries to guests or to eat for yourself. These are excellent to nosh on as you would nuts. They became pretty addicitive and I just kept going back for more. 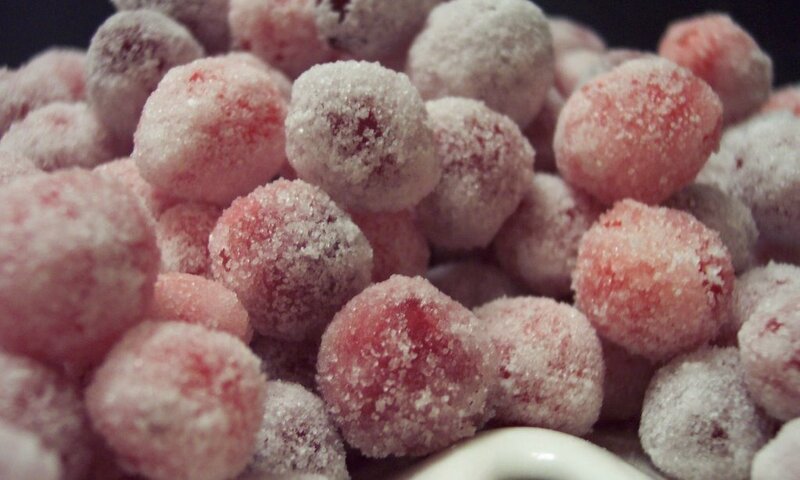 The coating on the cranberries takes on a cruncy texture and when you put one in your mouth it explodes with its natural tartness. The sugar helps ease the flavor so it does not overwhelm you. This would make for a great gift wrapped up in tins at holiday parties. If you desire, you could save the sugar syrup that is infused with the cranberries and use it for your mixed drinks instead of tossing it. Lunch was of course simple turkey sandwiches - how could we have anything else on leftover day? Dinner had to be a new recipe though. After going through the piles, I found a chicken pasta dish that sounded interesting so I changed it into a turkey one. Spicy Turkey Pasta comes together in a flash because when you use fresh pasta it literally takes just a minute to cook. A creamy sauce coats the tender angel hair and crushed red pepper ramps up the heat quite a bit. Next time, I would add some roasted red peppers for some contrast. Happy Thanksgiving to everyone out in the blogging world! Everything is done for the day (cooking at least!) so we're going into clean up mode and then taking the pups for a walk. After that? Relaxing... and leftovers! Yeah! Our menu today was Roasted Garlic and Fresh Rosemary Cloverleaf Rolls, Stuffing Muffins, Golden Smashed Potatoes, Herbed Lime and Tequila marinated Turkey Breasts, and Turkey Gravy. 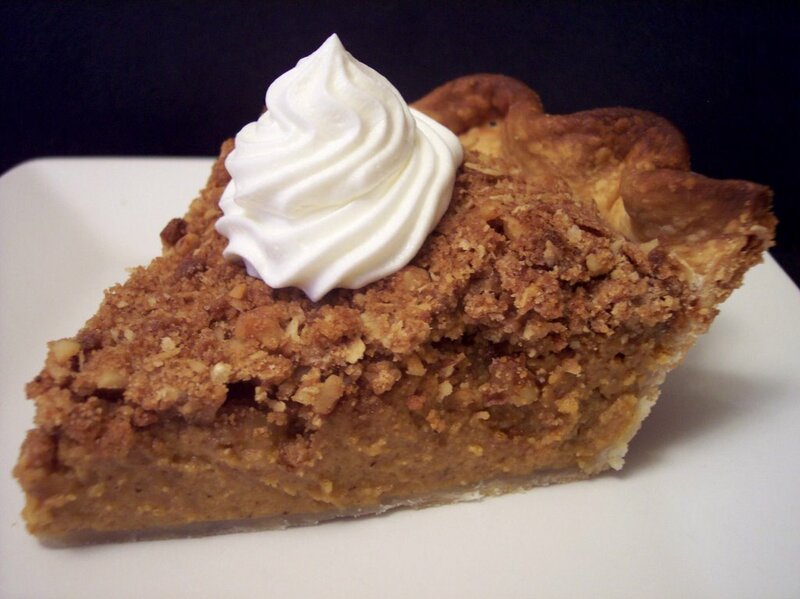 Cinnamon Streusel-Topped Pumpkin Pie with a home-made crust is on tap for dessert, but since that will be a little later I have not yet cut into it. I'll come back with a picture of a slice or 2 a little later, so don't forget to check back! 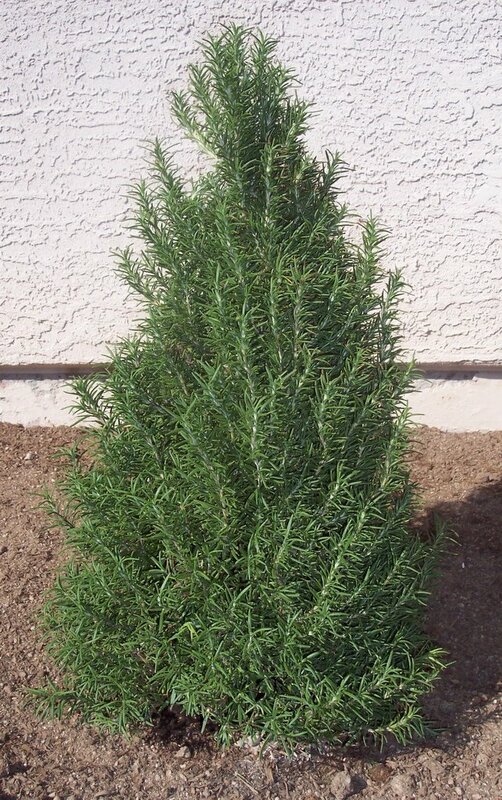 I've been pruning our rosemary bush to look like a small christmas tree this year. Hee hee! Here's the first plate for Jeff - nothing fancy and just a quick picture since we couldn't wait any longer! Almost time for turkey day! So I'm trying to keep things easy today since tomorrow will be filled with many things going on in the kitchen. I made a quick bread today and it was a breakfast-for-dinner night. 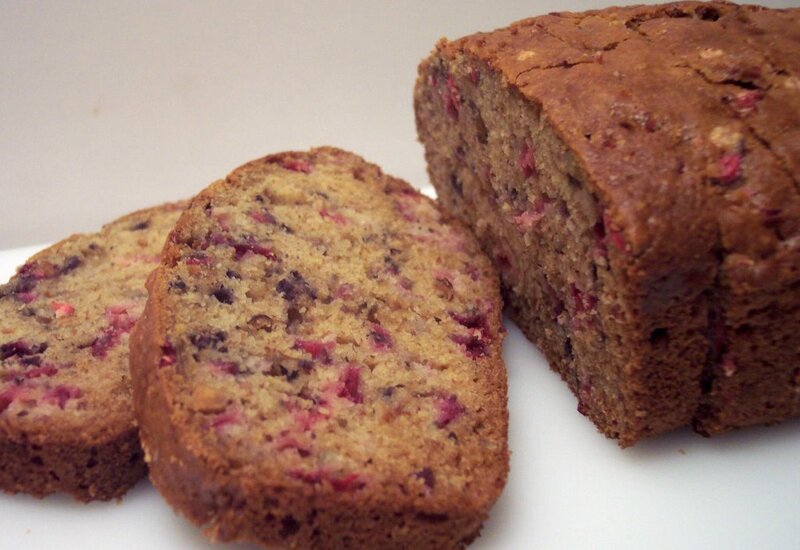 Cranberry and Hazelnut Quick Bread starts out with a light batter, but after baking the crust turns into a deep golden brown color. I would check early as mine was ready about 5 minutes before the timer was to go off and it tested done. 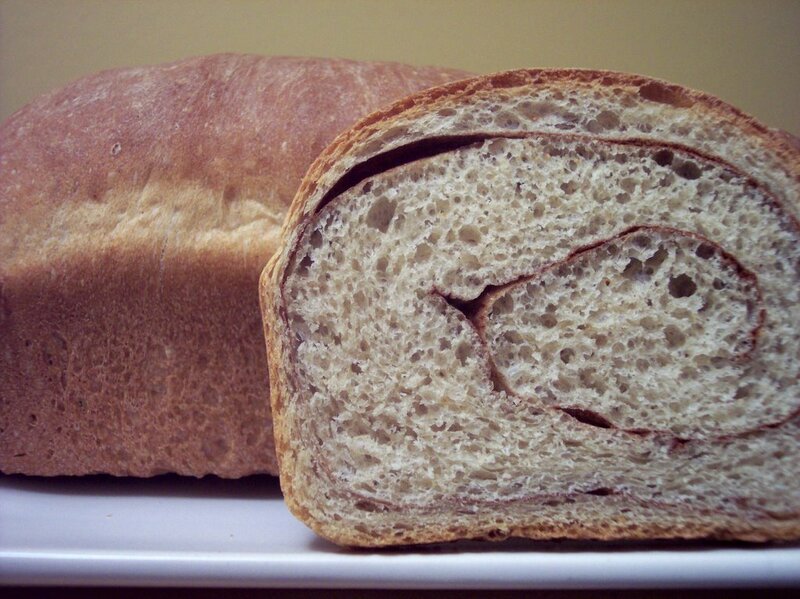 The resulting loaf is very moist with a wonderful aroma of chopped cranberries and toasted crunchy hazelnuts. I've found that with some quick breads the slices tend to not always hold together well, but these stayed firm and held their shape well. You could substitute walnuts for hazelnuts if you wish. 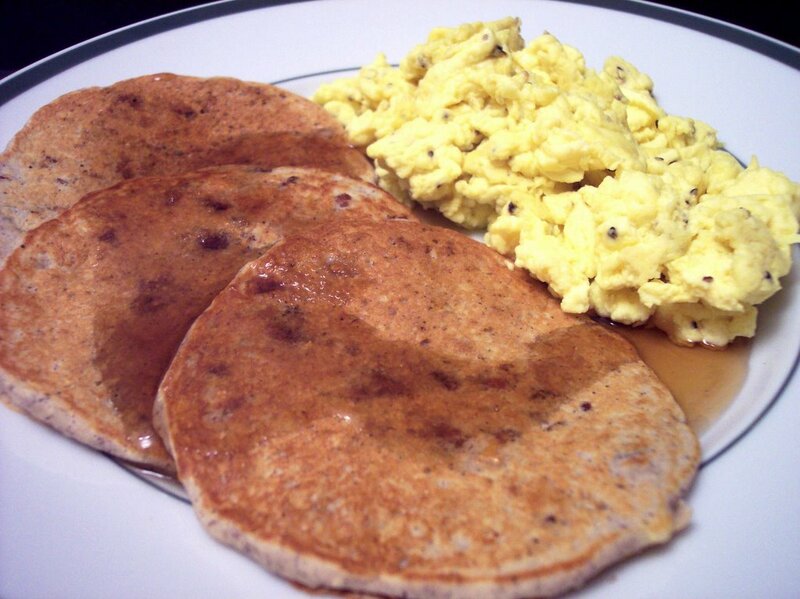 Banana Pecan Blue Cornmeal Pancakes with scrambled eggs came together quickly for dinner tonight. I thought the pancakes would have taken on a slightly more blue color, but a light hue could still be seen after being cooked. 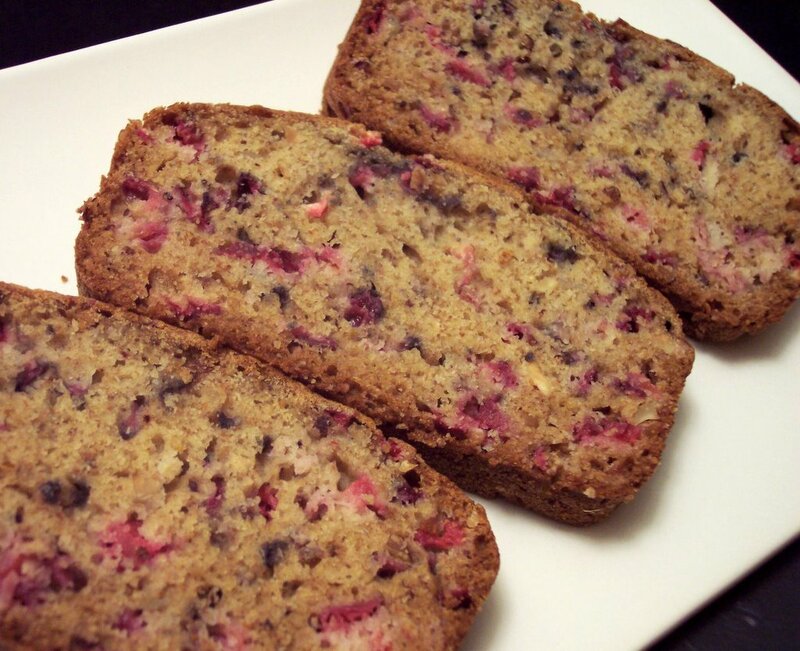 They are soft, light, fluffy, and the banana flavor shines through these tasty cakes. The toasted pecans add a depth of flavor with a nice crunch. Simply adorned with warm pure maple syrup - what could be better? Kitchen workout... lots done today! Since it is Tuesday, we will start off with what Jeff will be bringing for the Wednesday Treat Day tomorrow. He will be bringing 3 things, but the third will not be ready until the morning so you will have to check back another time when I can post about it! 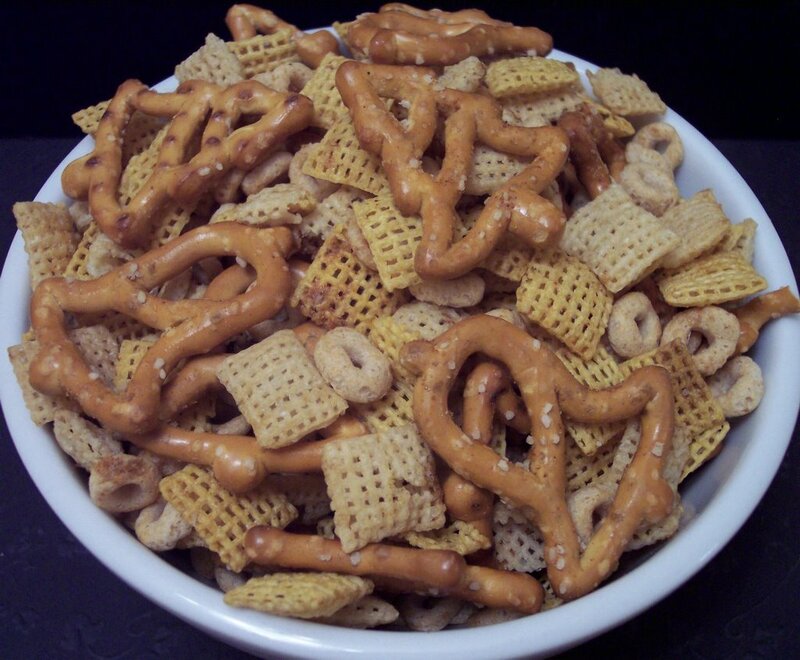 Spicy Chex Mix is something I have been making for the past 3-4 years during this time of the year. It is a lighter version as there is no melted butter - it uses Butter buds and butter flavored spray for the buttery taste. I can't tell that it's missing it and usually goes fast when we bring it somewhere. I find the holiday pretzels very festive and we saw them again at Costco this past weekend. I always use this kind and I'm happy we found them again! The mix is salty, crunchy and just spicy enough to make you wonder what is giving it a kick. This is definitely a favorite of ours! 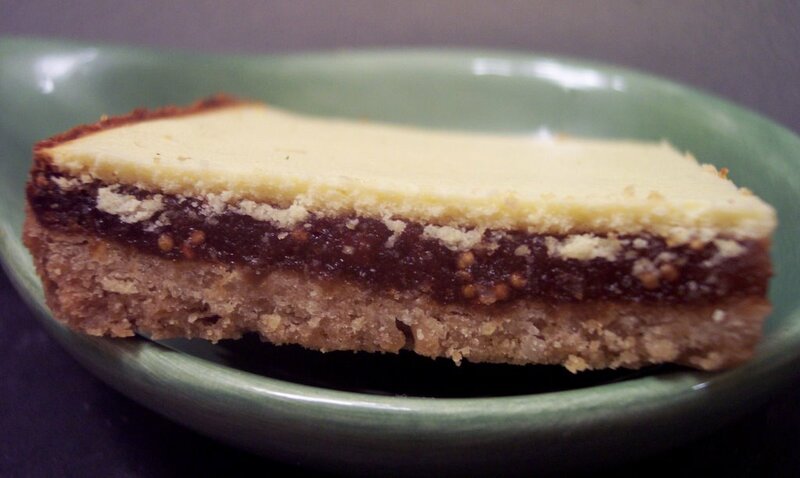 The next item, Fig and Cream Cheese Bars, looked like something fun to make as I've never baked with figs before. I used a 9X13 springform pan, so they are just a touch thinner than if you used a normal one. 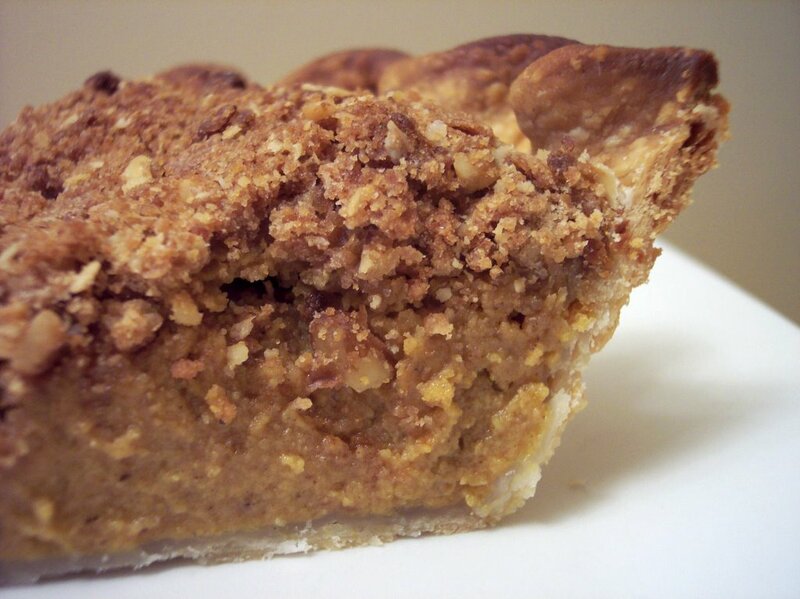 The crumbly and buttery crust is topped with a thin layer of pureed figs and then a cream cheese mix is spread over. The figs bring a unique honey flavor under the sweet cheesecake like topping. You do have to be pretty gentle in spreading the fig mixture over the top, or you will end up lifting up the crust and it could get messy. I used a small off-set spatula and as long as I kept it moving, I didn't have any issues. Okay, on we go to dinner. Tonight's soup was sure interesting! What a combination of flavors! 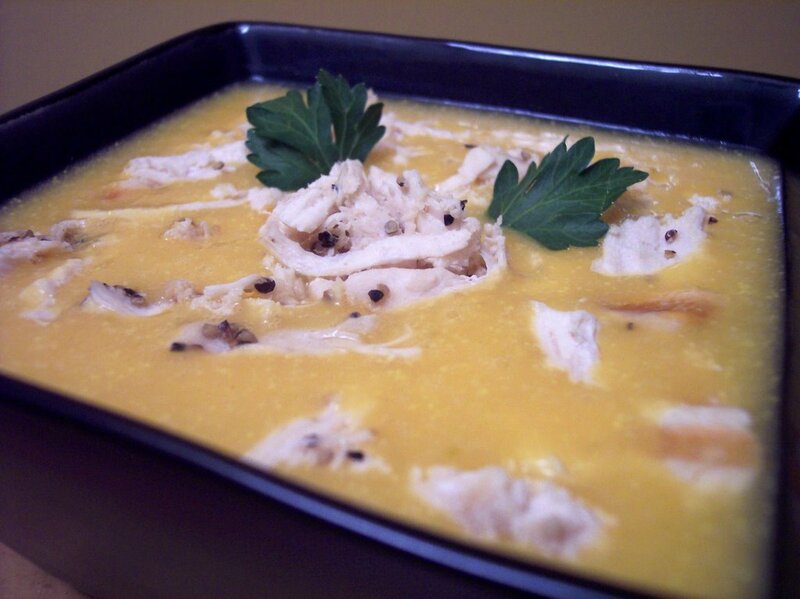 Potato, Chicken, and Coconut Soup brought strong Asian flavors coming from fish sauce, ginger and the lemongrass. The resulting soup was smooth, rich and creamy. It has a pretty wicked kick from the ginger and chili paste. The coconut and lime were subtle background flavors and did not overpower at all, just enough so you know they were there. This would have been something I normally pass over while going through recipes, but since we are trying to branch out I saved it. I'm glad I did as this was very good! Different and refreshing! 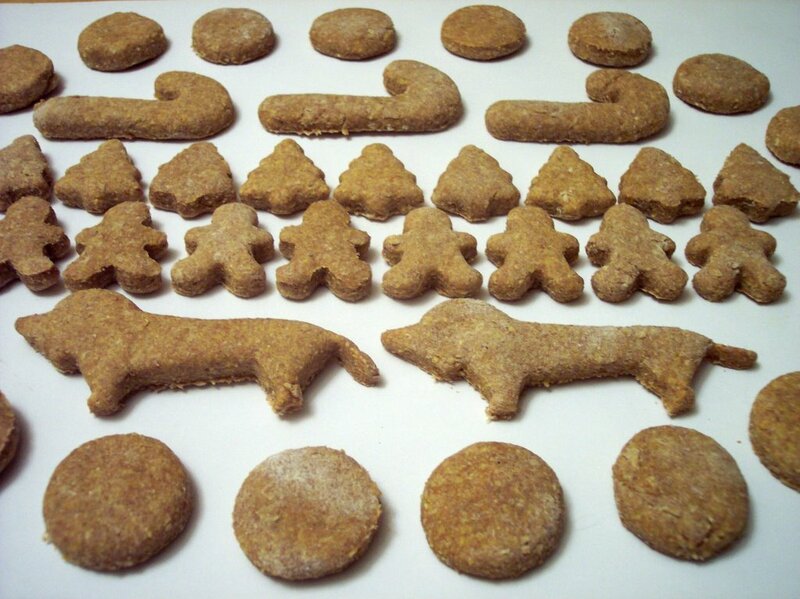 I recently saved a recipe from a local grocery flier called Pumpkin Canine Cookies. 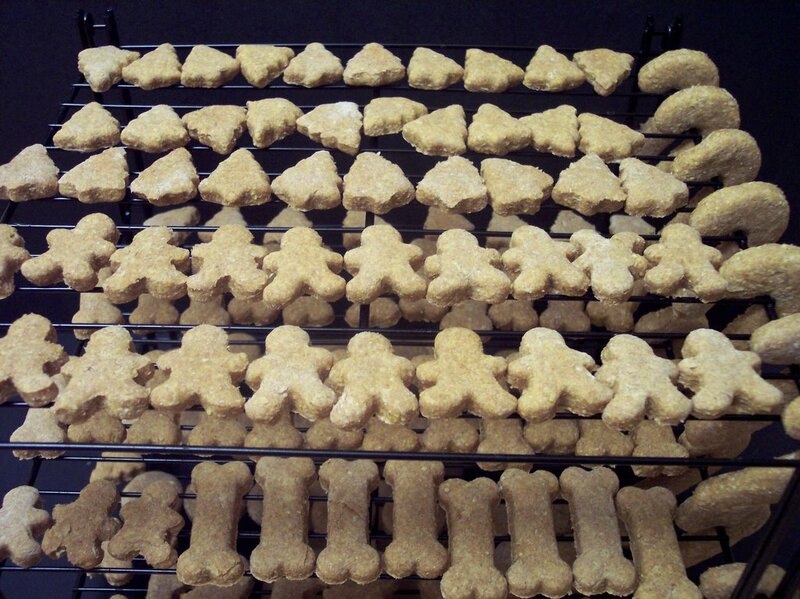 Since the pups were out of treats from the last time we made some, I thought I would go for a new recipe and make some festive cut-outs for them. After quickly looking over the ingredients I noticed there seemed to be way too much liquid to dry ingredients. I followed the recipe as stated and I added almost 4 cups more flour before the dough was even ready to be rolled out. I thought I missed something, so I re-read the recipe a few times and I had everything correct - maybe they left something out of the list? I went forth and changed a couple things in the recipe and the dough finally came together. The dough was nice and soft, but not sticky. They puffed up a little in the oven, but after cooling they crisped right up. Having to add that much flour though, I ended up with a lot more biscuits than I had planned on! Although, I'm sure the doggies are very pleased with that! They waited patiently (yeah... right) and gobbled them up after they were cool enough. I really love the combination of flavors that comes from pork and cranberries. 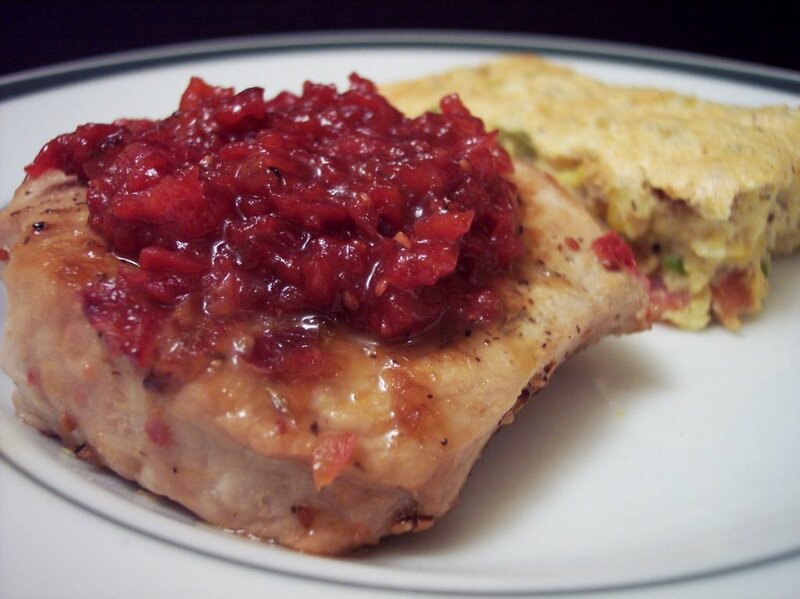 Easy Pork Chop Sauté with Cranberries was the lastest use of fresh cranberries for us. This was a quick dish to prepare and very tasty. The pork remained juicy with a sweet, tangy, and thick sauce on top that brought a burst of flavor in every bite. I could eat the cranberry sauce alone and be happy! Unlike the above, the next dish took awhile to prepare. Sweet Corn Soufflé with Bacon puffed up quite well in the oven, but slowly lost some of its height while we took the picture. Gently stirring about 1/4 of the egg whites into the dense corn mixture helps to lighten the base so you can easily fold in the remaining whites without deflating them too much. The resulting dish was light, airy and a nice contrast of flavor with salty bacon paired against the sweetness from the corn. I gathered up the recipes from this past week and we made 11 new ones. Highlights for us were the Caramel Cashew Cookies, Cream Cheese Swirl Blondies and Hash Brown Casserole. Recipe list on the left has been updated! It took me quite awhile last night to figure out the menu for this week - trying to keep it somewhat varied with Thanksgiving coming up. 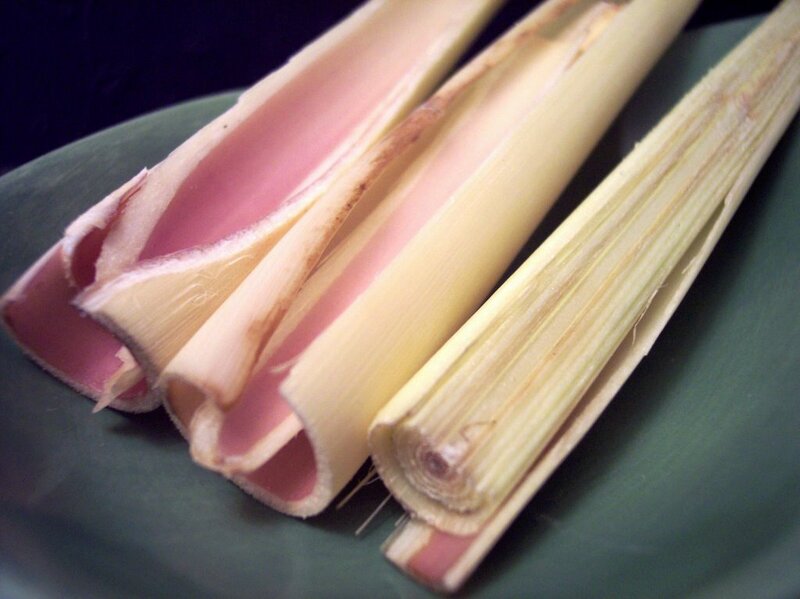 One of the recipes includes a new-to-us herb called Lemongrass. Can't wait! We liked the movie last night, but I thought Mr. Wonka was... I don't know - a little creepy? I'm glad I had seen the original as I'm not sure I could of followed it otherwise. Funny though! For tonight's selection, Netflix sent us The Sisterhood of the Traveling Pants. With Thanksgiving upon us, this week will be pretty busy! Even though it is just two here, I still try to make a large selection of food. It may not be totally traditional - but we do include some of the normal things and you have to make enough for the best part... leftovers! I also have plans for more uses of cranberries - stay tuned! 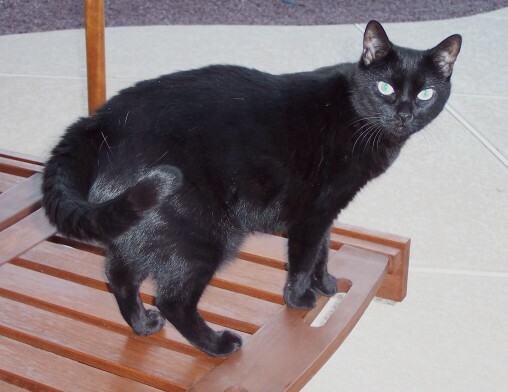 Miss Kitty was outside with us and meowed "What a dummy!"... Since she is already here, Miss Kitty wanted to welcome back Clare, the host of weekend cat blogging over at Eat Stuff. We are glad to see her getting better! Every weekend, food bloggers share pictures of their kitties and with help from Kiri, Clare gives a wonderful round up so head on over to see some more! As usual, chicken salads were enjoyed for dinner tonight. Will next Saturday hold the same? It will be Thanksgiving weekend afterall - there might be a change in order! Netflix sent us a great selection this week. Tonight we will be watching Charlie and the Chocolate Factory - I'm surprised we were sent this already since it just came out! I hope to finalize the menu for this week including Thanksgiving stuff later this evening. I am guessing it will be a very busy week in the kitchen here! 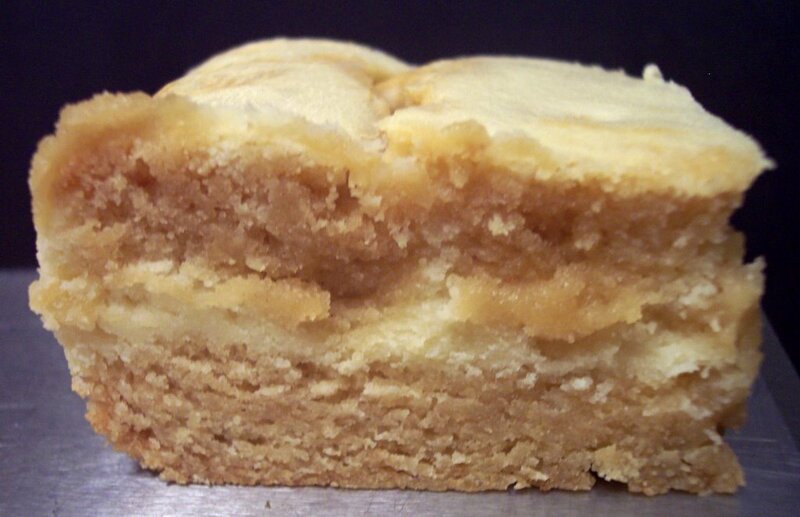 I was busy flipping through Martha's cookie magazine looking for something to make today and came across a recipe for Cream Cheese Swirl Blondies. I've made more brownies than blondies in my life so it is a nice change a pace for something different. Since I only have one mixing bowl for the Kitchen Aid, I did clean the bowl/paddle as suggested to keep the mixtures separate. Because you swirl them - I'm not sure it *has* to be done but I could see why. After layering several times, the final cream cheese dollops are swirled into the layers making for a nice design on top. I suggest checking these early as mine were just almost done when I did a toothpick test - a small amount of crumb attached. I tend to always check early as I am not confident with my oven cooking evenly. 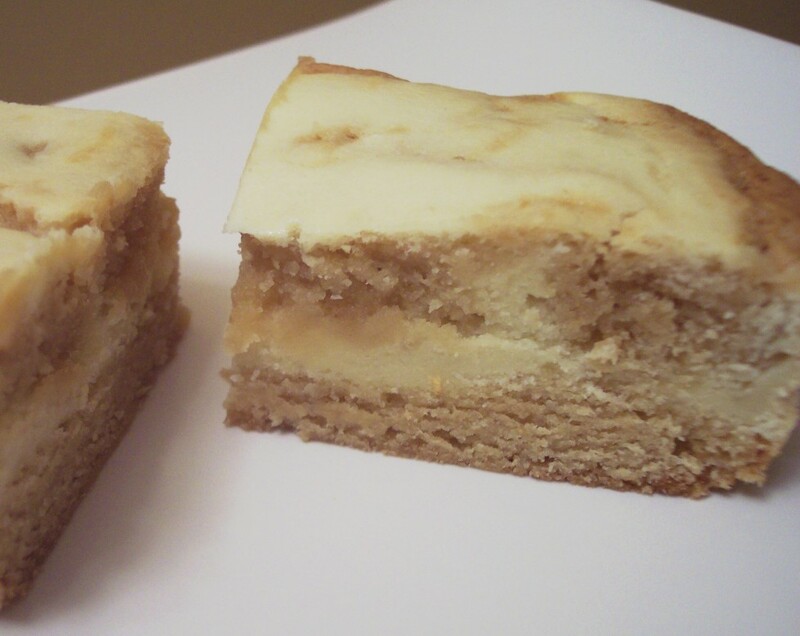 This is a rich and dense blondie with flavors of brown sugar and creamy pockets of a cheesecake like mixture throughout. I was not too hopeful about dinner tonight. I was cutting strips of tortillas and was asked if I was making tortilla chips. Nope, I replied, then looked over at the pot of simmering chicken stock. I then said "I'm not really sure how this is going to turn out, so we may have dig out some leftovers." 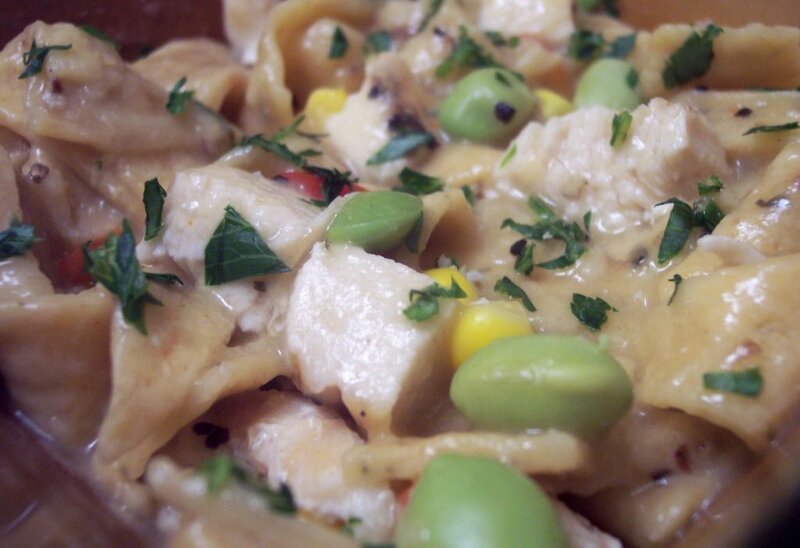 I thought Quick Chicken and Dumplings was going to be a liquidy soup, but surprisingly it turned into a warm, comforting, thick stew or almost savory pie filling. Very quick to make, the stock is simmered with some veggies and the tortillas are thrown in to soften up and absorb a lot of the flavorful liquid. They were sorta like dumplings but not quite. The tortillas ended up soft, but not mushy. I used a chipotle chili flavored tortilla and that added a bit of heat to the dish. I made quite a few things today to try and get caught up from not being able to use the kitchen much the past couple of days. Since Wednesday Treat day was pushed to Friday, this morning I got some made so the co-workers will give Jeff a reprieve. Let's start off with Key Lime Coconut Snowballs. These are a quick no-bake item that has great key lime flavor. If you can't find key limes, by all means use regular limes - I do think the small ones give a little more acidity and cut the sweetness better. I have not been thrilled with bottled key lime juice so again I would just squeeze the persian limes. *Note to self... must buy a small citrus reamer for stuff like this! 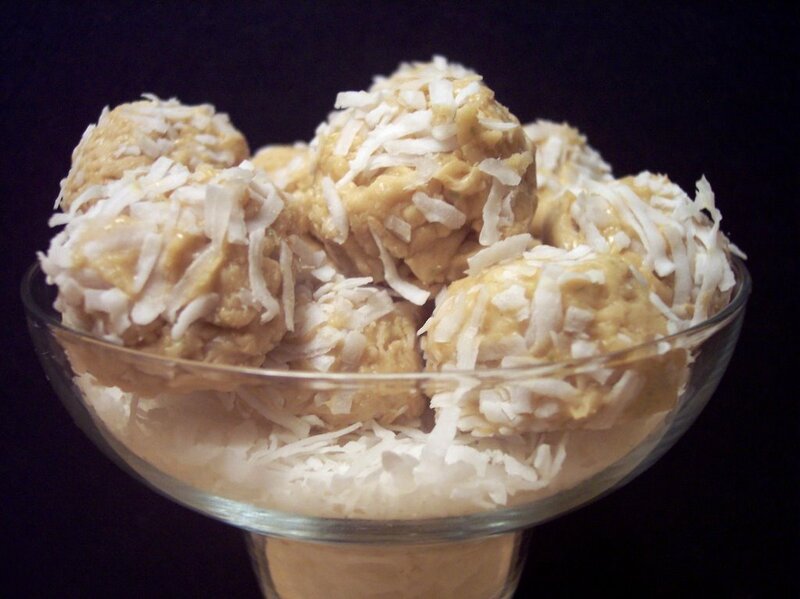 The soft sweet balls, rolled in desiccated (unsweetend) coconut, are pretty balanced in flavor. I used Trader Joes thick graham crackers which I find have a better flavor than regular crackers. The texture is almost like cookie dough. I mentioned I picked up the Martha Christmas Cookie magazine a couple weeks ago and this is the first (of many I'm sure) cookie I made. 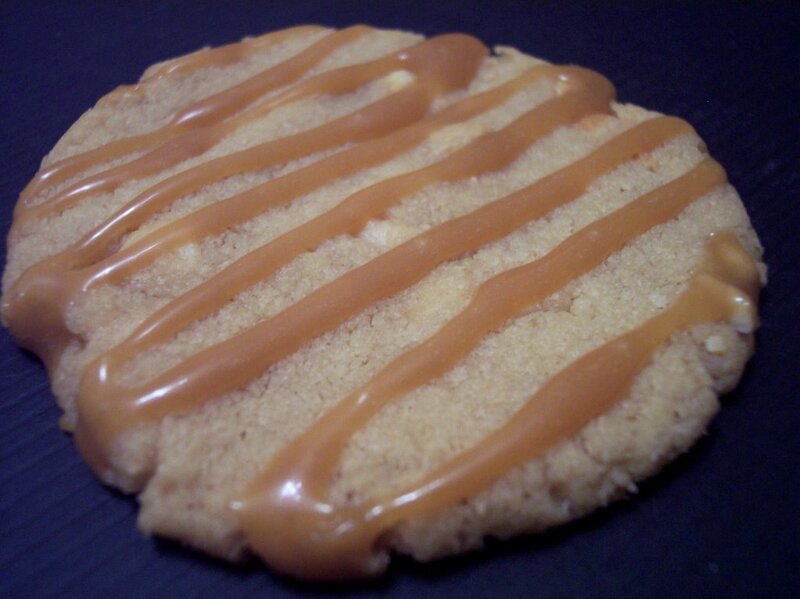 Cashew Caramel Cookies turned out to be such an awesome cookie. Making fresh cashew butter was key to impart such a rich flavor. Even after using more than half of the cashews for the butter, there is a generous amount of remaining bits in each cookie. The cookies are not crispy or soft, but they are a firm chewy cookie. Adding a soft caramel drizzle puts these over the top. The caramel does set a little, but does not get hard so you have to store them in a single layer at room temperature. If you are going to freeze these - do them on the cookie sheet and when frozen you can stack them between wax/parchment paper. Definite repeater. So let's head on to dinner! 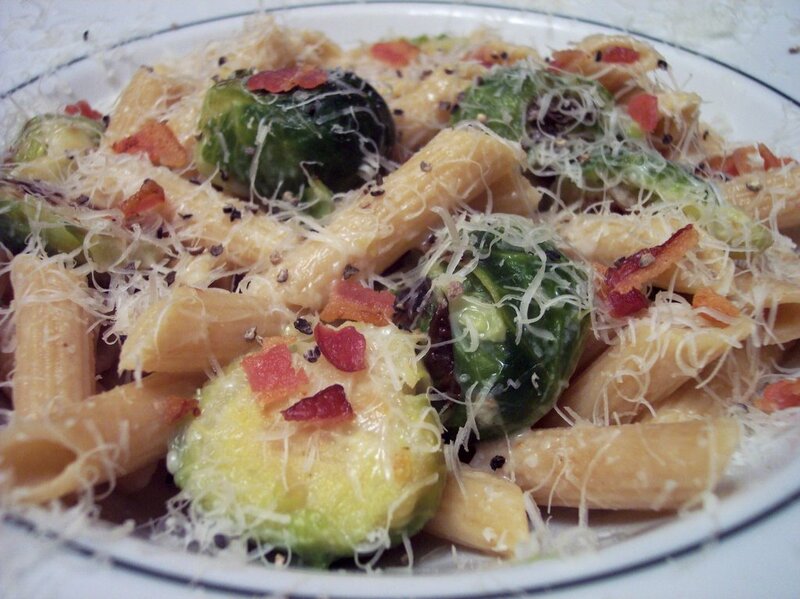 Tonight's dish of Penne with Brussels Sprouts and Crisp Bacon was a fun way to get some veggies in. Although it does end up using quite a lot of dishes and is a little time consuming, I think it was worth it. I did have to tweak it here and there, but overall it is pretty solid. The sauce was a little thin even after my changes but the pasta did soak up quite a lot after sitting a few minutes. The bacon adds richness while the parmesan lends a nice bite. Jeff does not usually care all that much for brussel sprouts but he gave this one a thumbs up! Tonight's dinner was a creamy, cheesy and very comforting potato casserole. Hash Brown Casserole with Bacon, Onions, and Cheese can be prepped the day before and left to sit in the refrigerator overnight. 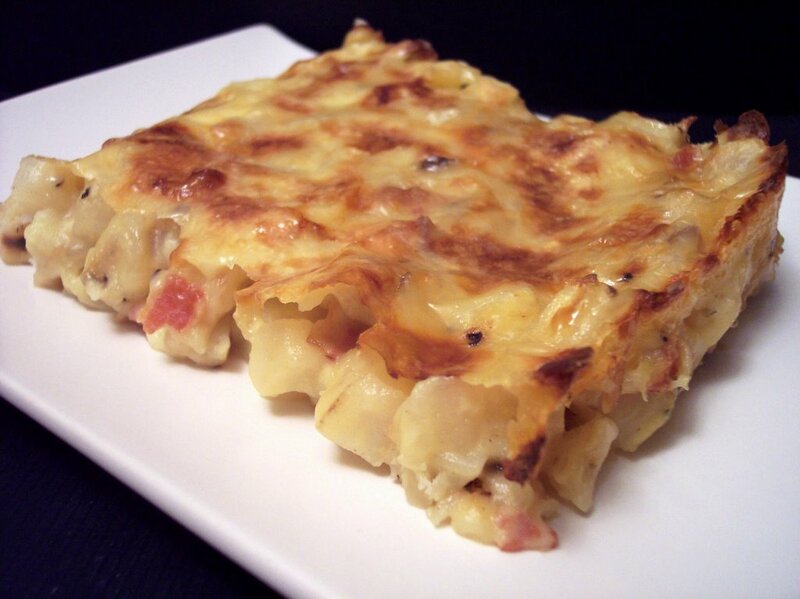 The end result has tender cubed potatoes mixed in a velvety sauce with a smoky background from the crisp bacon. A generous amount cheese covers the dish before baking and ends up with a nice crust around the edge, while slowly turning to a luscious gooey center. 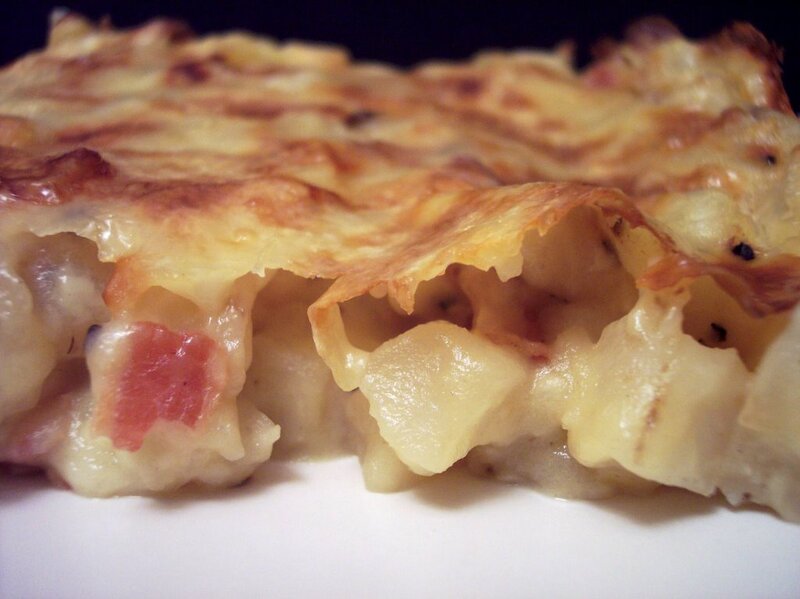 It almost reminds me of scalloped potatoes, but taken to another level. 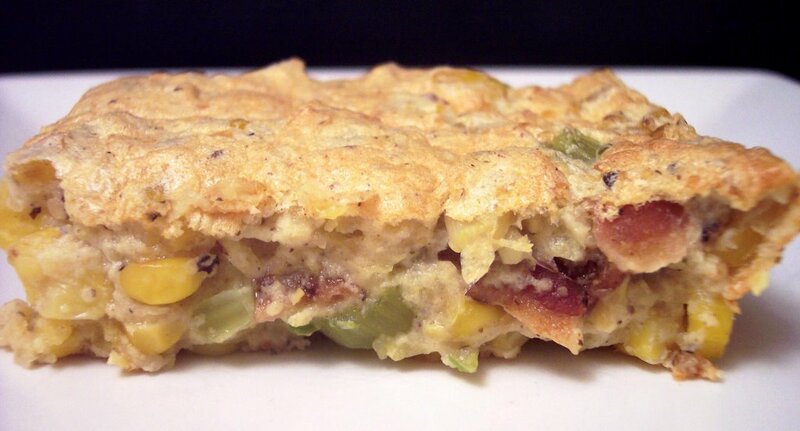 This would be a good breakfast casserole for guests since it can be all done ahead of time. Normally on Tuesdays I will blog about what I made for Jeff to bring into the office for Wednesday treat day. Since during most of the morning and early evening the kitchen was unusable, it will be pushed back until Thursday. I'm making two things for them to make up for it though! I had barely enough time to get dinner done tonight when I finally got control back in the kitchen. Hopefully tomorrow they will be done a little earlier. 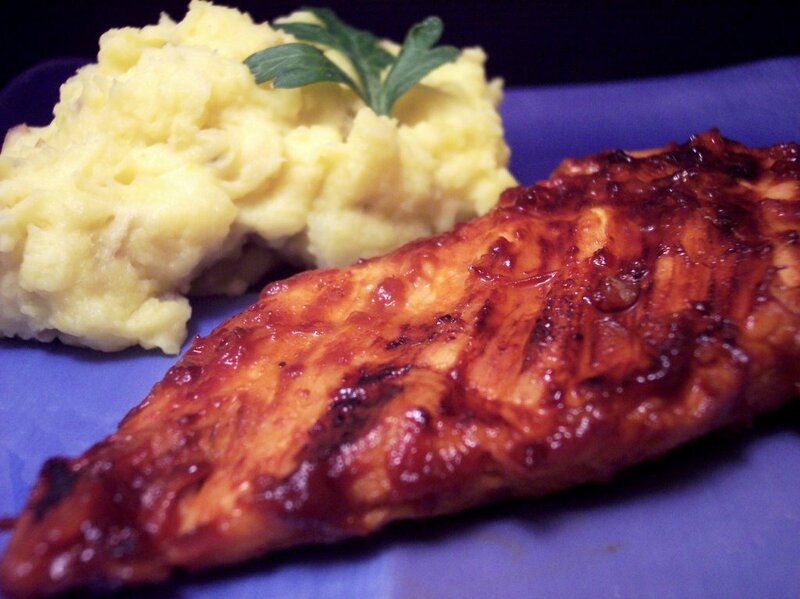 I made Honey Barbecued Chicken Breasts along with Golden Smashed Potatoes for dinner. After simmering a variety of ingredients for the BBQ sauce, it is cooled and then most of it is used to marinate the chicken. While cooking, the reserved amount of sauce is used to baste. The result is a tangy, spicy and moist piece of chicken. The heat mainly comes from the Sriracha sauce so if you don't like it spicy you can reduce it some. 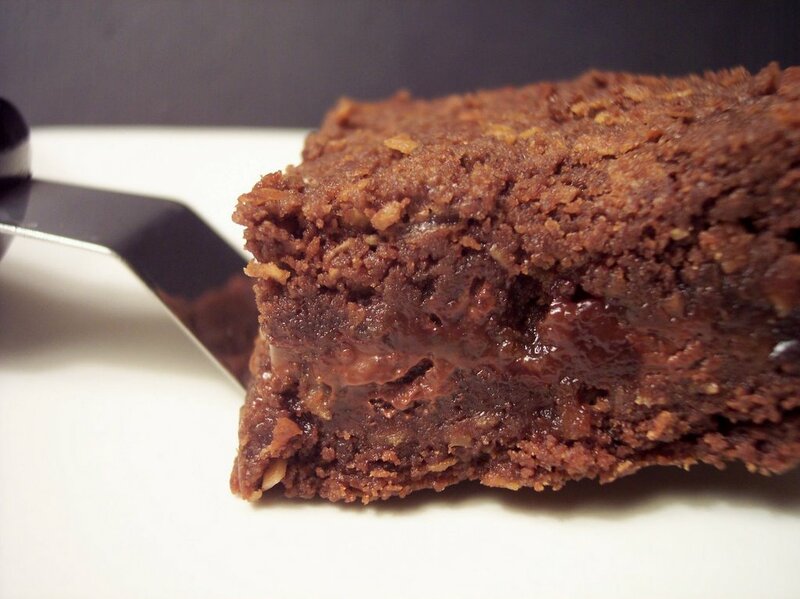 Using half honey and half molasses gives a sweet yet rich depth of flavor. I can see using this sauce on all sorts of meats. The smashed potatoes are a little different than your normal mashed potatoes. Mustard seeds are first toasted in olive oil to bring out their flavor. Maple syrup added to some milk lends a subtle sweetness and the turmeric gives a golden hue with a slight earthy tone. The milk mixure is then simmered down from 1 cup to 1/2 to enchance all the flavors before it is added to the tender potatoes. When I was younger, I would never eat any potatoes that had any sort of texture - if it was not smooth I would not go near them. Boy am I glad that my palate has changed a little, because these were very good! Over the weekend, we were at Costco and noticed they have started to carry these humongous bags of fresh cranberries. Of course, I had to buy them so I'm looking to use them up and also freeze some for later use. 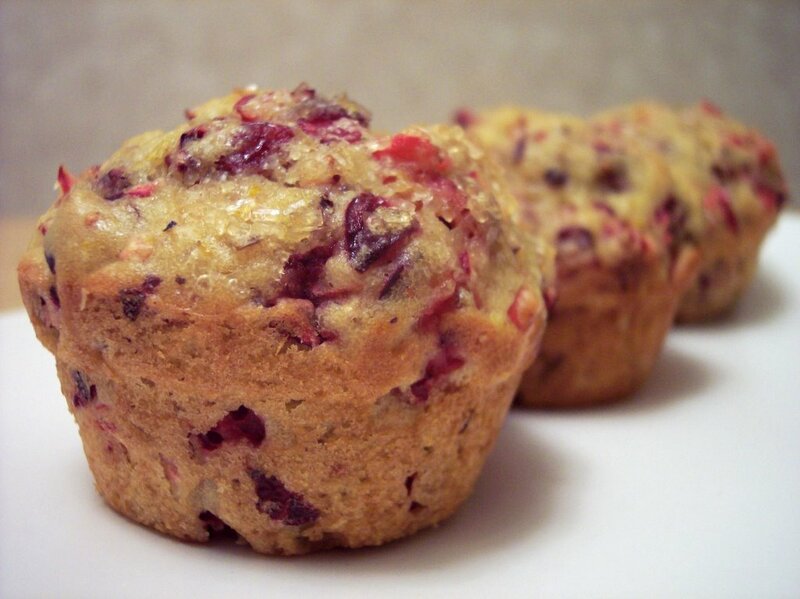 To start using them today I made Cranberry-Orange Muffins. 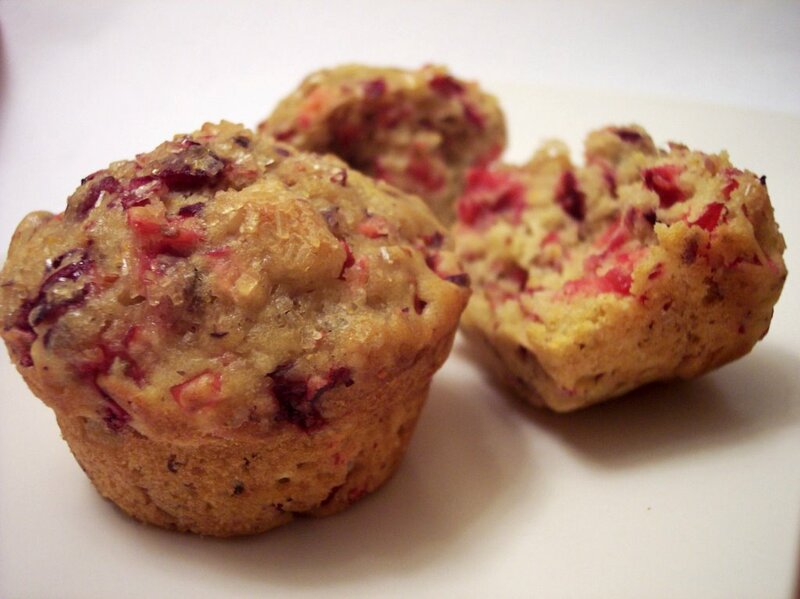 These muffins are packed with coarsley chopped cranberries and toasted walnuts. They are very moist and the fresh orange juice/zest bring a lot of flavor into the tender muffins. The walnuts add a crunchy surprise and the additional sugar sprinkled on top lends a nice sparkle. So far, these have definetly moved to the top of my favorite muffins. A few weeks ago we bought a dry stuffing mixture to make a sausage casserole. I wanted to get the rest of it used up, so tonight we combined it in an interesting way. Stuffing-topped Turkey Pot Pie turned out to be much better than expected. Instead of a traditional pastry topping, we spread some stuffing cubes moistened with turkey stock over a vegetable and turkey mixture. 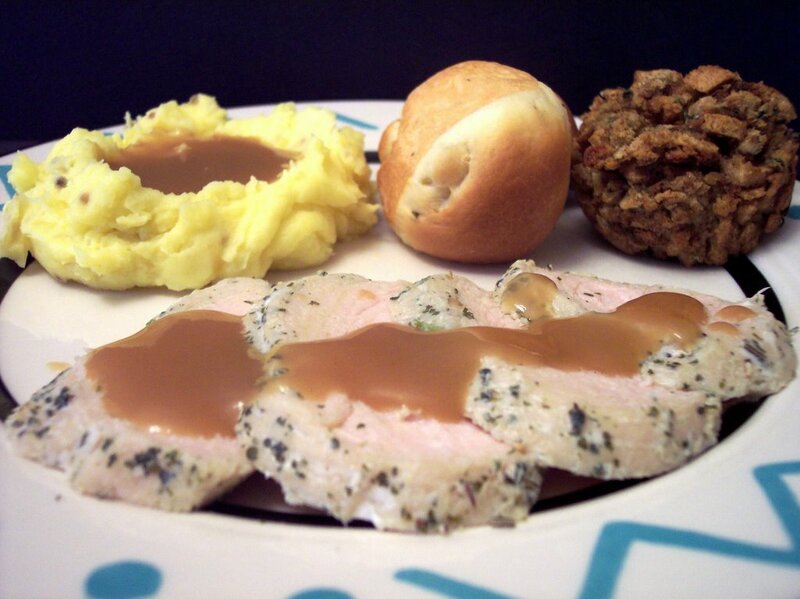 To give a little more moisture and a creamy texture we used some turkey gravy. I made the gravy after roasting a turkey earlier so I could have some meat on hand for lunches later in the week and in this dish. 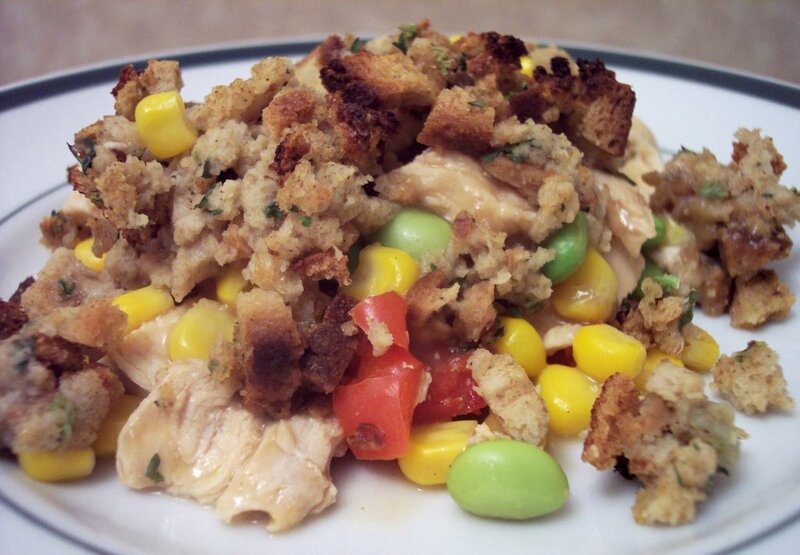 After baking, the stuffing on top had a crispy texture and pulled all of the flavors together. Serving along side I used the vegetables I mentioned yesterday. 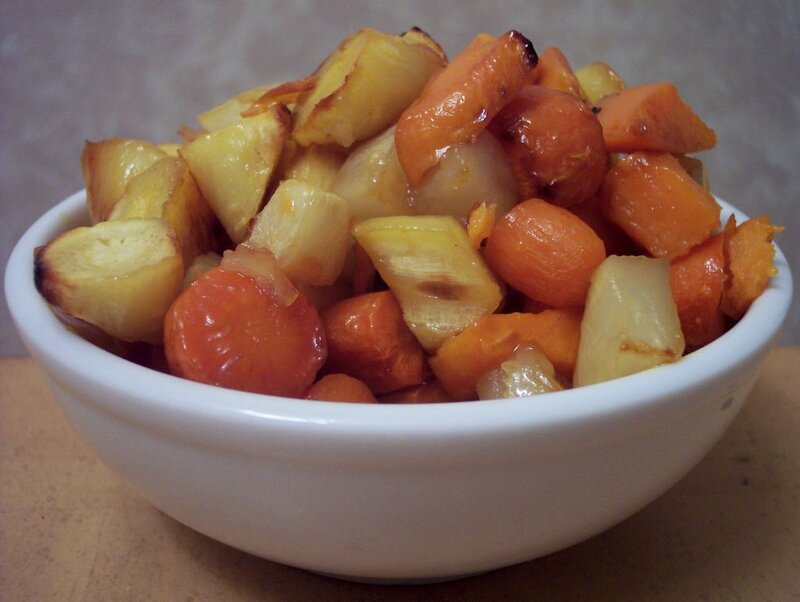 Honey-Roasted Root Vegetables is a mixture of Parnips, Sweet Potatoes, Turnips, and Carrots which are seasoned with dandelion honey, olive oil and salt. The original recipe called for tupelo honey, but I did not have much luck finding that in my area. The vegetables obtained a glazed caramelized finished and the dandelion honey gave them sweet and slightly floral flavor. Going over this past week, we've made quite a few things again! We made 11 new recipes and 1 repeat from the past. Standouts for this week were the Chocolate Peanut Butter Ribbons and the Mozzarella-Stuffed Turkey Meatloaf, which by the way, made excellent meatloaf sandwiches for lunch. I've just updated the recipe section with this past week's worth. Don't forget from this week on you can click on the pictures from new posts to see a bigger and a little more clear version. 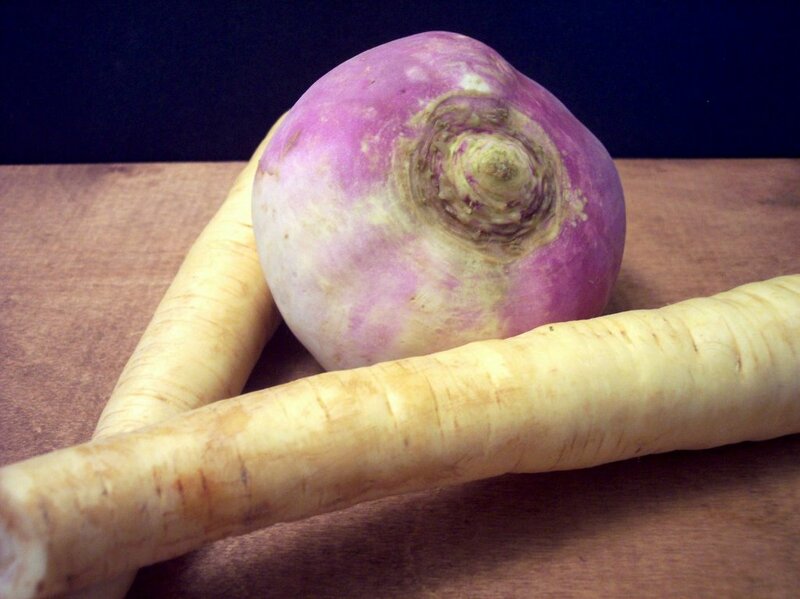 Tomorrow night we will be using a couple "new to us" vegetables. 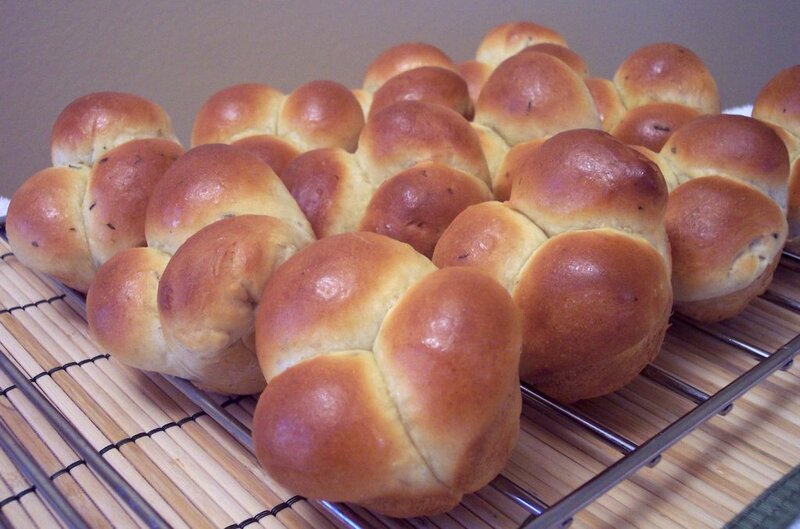 I've been wanting to use them for awhile and came across a recipe that looks promising! Come back and see what these turn into! We liked last night's movie, Kingdom of Heaven, but it was a little hard to follow. It sometimes seemed like important scenes were missing. Tonight's movie from Netflix, Batman Begins, with Christian Bale and Miss "TomKat" Katie Holmes, is something I have been waiting impatiently to see. We were going to see this at the big Imax close to us, but we never got the chance to. I have the menu planned out for the week ahead, but the kitchen is having some changes done to it Tuesday and Wednesday which puts a kink into my plans so some things are being moved around. I should be able to make dinner without problems, but baking may have to wait until later in the week. Stay tuned to see what's happening from our kitchen!